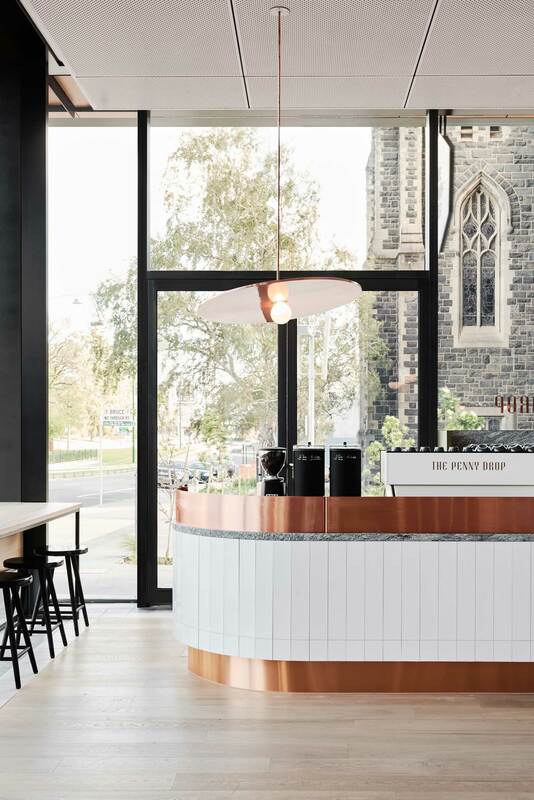 Penny Drop Café in Melbourne by We Are Huntly. 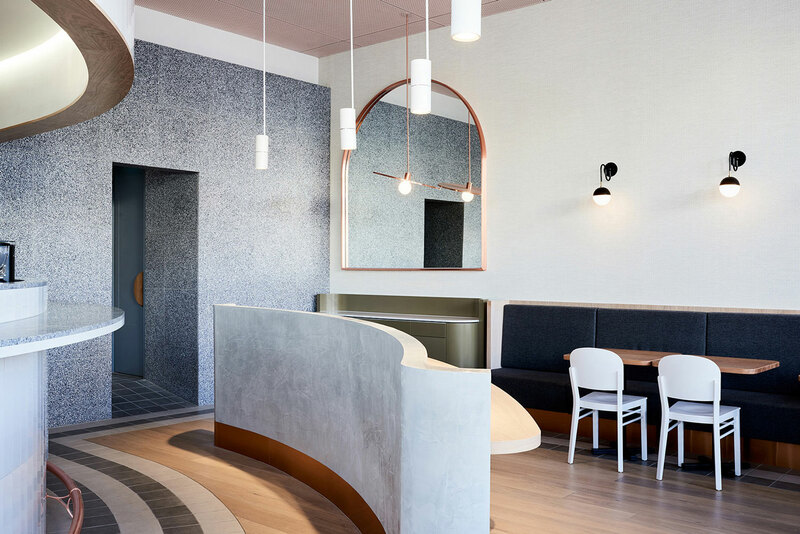 Layered, tactile and sophisticated, yet playful and full of personality – these are just some of the words that come to mind when looking at the images of The Penny Drop Café in Melbourne’s Box Hill. 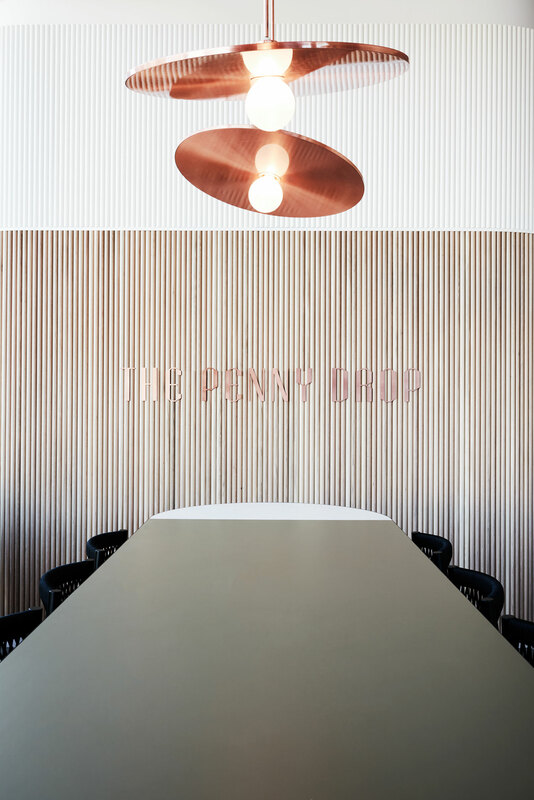 Designed by We Are Huntly, in collaboration with a branding agency Pop & Pac, The Penny Drop sits at the base the new Australian Tax Office building, cheekily playing on the concept of the ‘penny dropping’ from the pockets of the ATO office above. 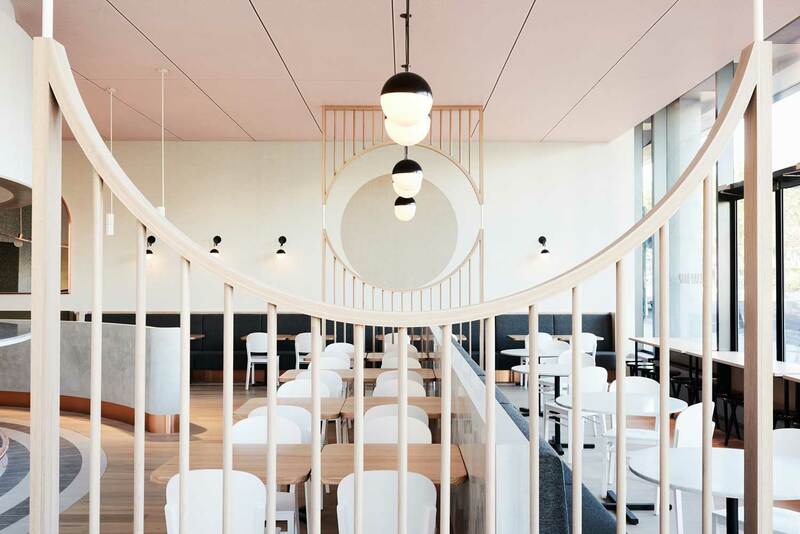 There is a lot to love about this gorgeous interior – curving geometries, tactile surfaces, terrazzo and granite, art deco light fittings, copper accents, and a perfect palette of soft pastels offset with natural materials. 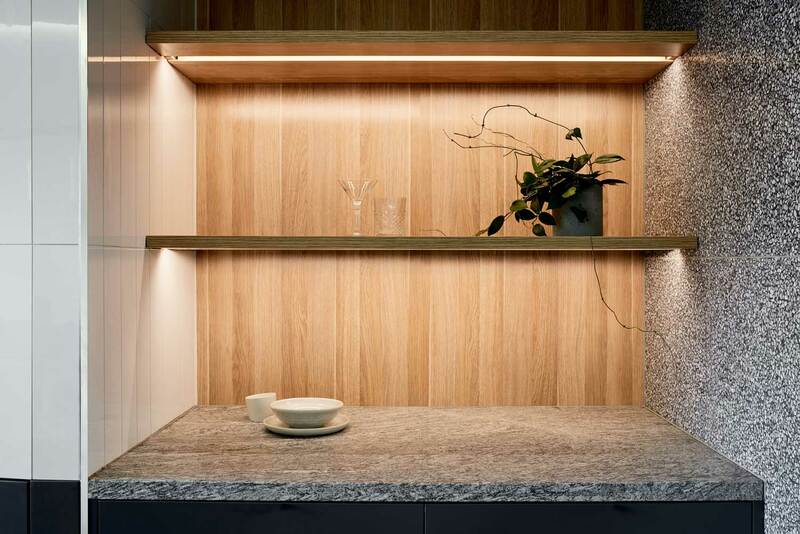 Each corner appears to deliver a different mood, yet everything comes together seamlessly and effortlessly. 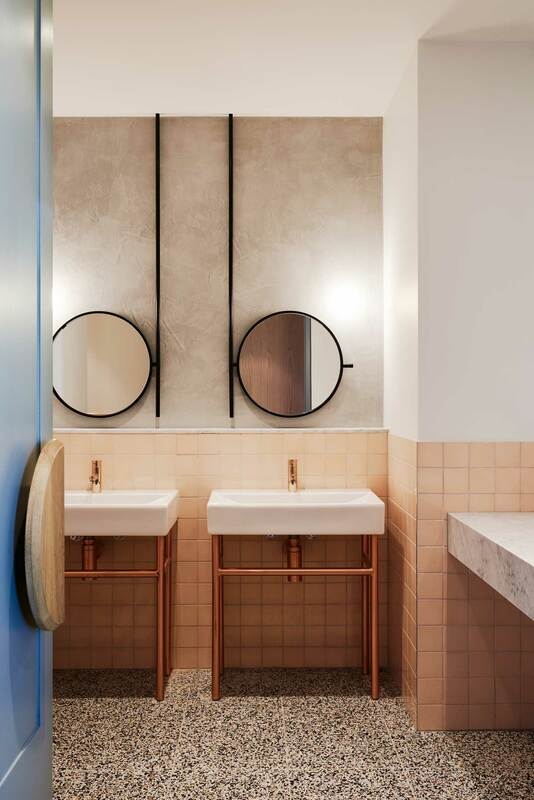 We Are Huntly is an interior design studio based in Melbourne bridging the gap between architecture and visual arts – looking at the bigger picture, by considering all of the little things. We had a quick chat with Kylie and Alicia about this beautiful project. Read on for further insight from their perspective. 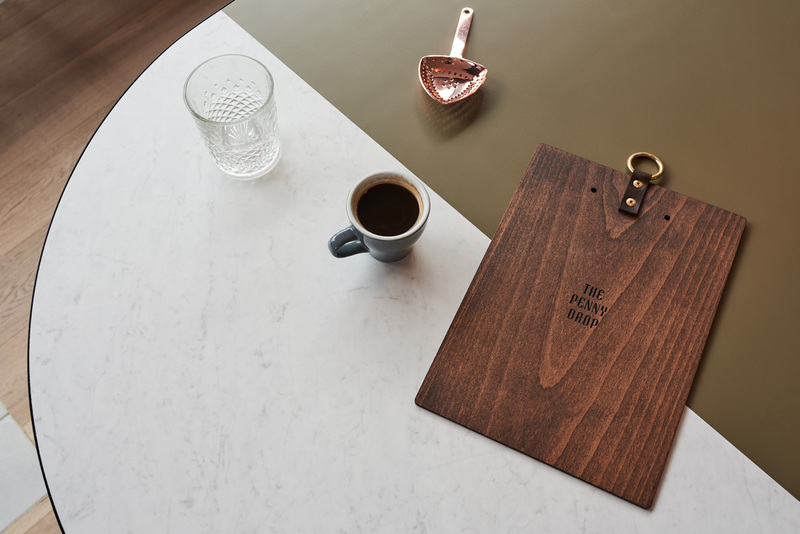 The Penny Drop boasts confidence in the design approach of ‘one big idea’. 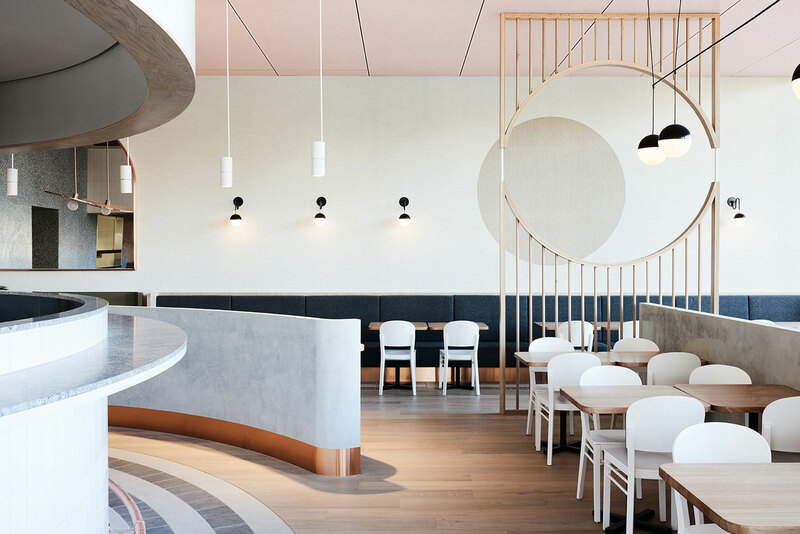 The interior responds directly to the strength of the brand identity prepared by Pop and Pac in unison with the client brief and local patrons needs. We had a fantastic project team, the collaboration between the Pop & Pac (Graphic Designers) S&K group (The Builder) and the client was really successful. The communication between all parties made for a great result. Adding warmth to a large volume. The tenancy sat at the base of a corporate building with floor to ceiling glass façade. 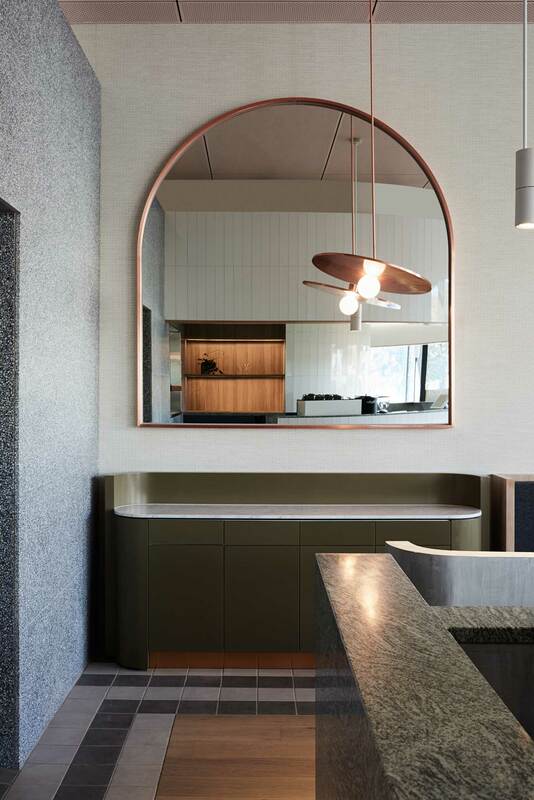 The insertion of warm finishes and consideration to the various heights within the space helped to create a more intimate space. We learnt a great deal about the operational side of a café / restaurant. 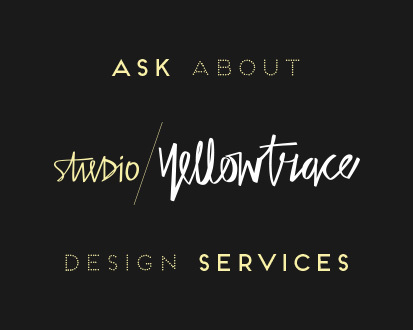 We had to ensure the space satisfied the brief of needing multiple points of service and through this process with the client and consultants our knowledge grew. 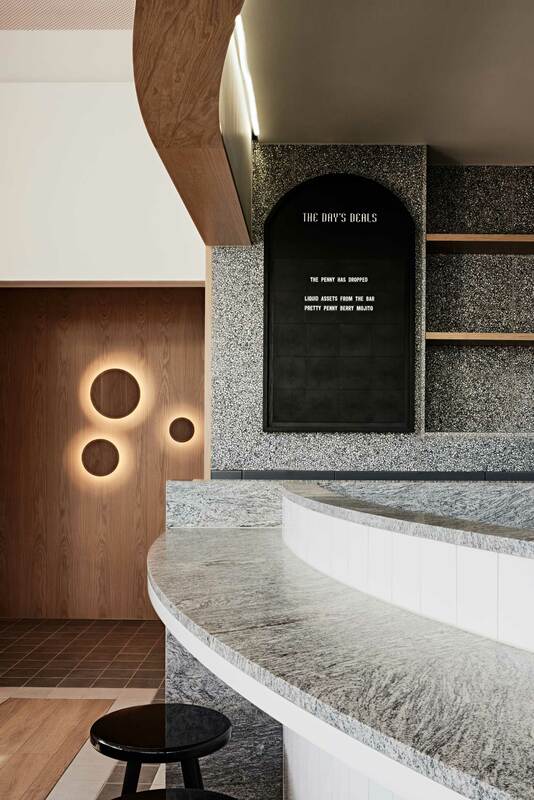 Every design decision made in relation to the counter and bar had to feel seamlessly integrated into the interior and serve a functional purpose. 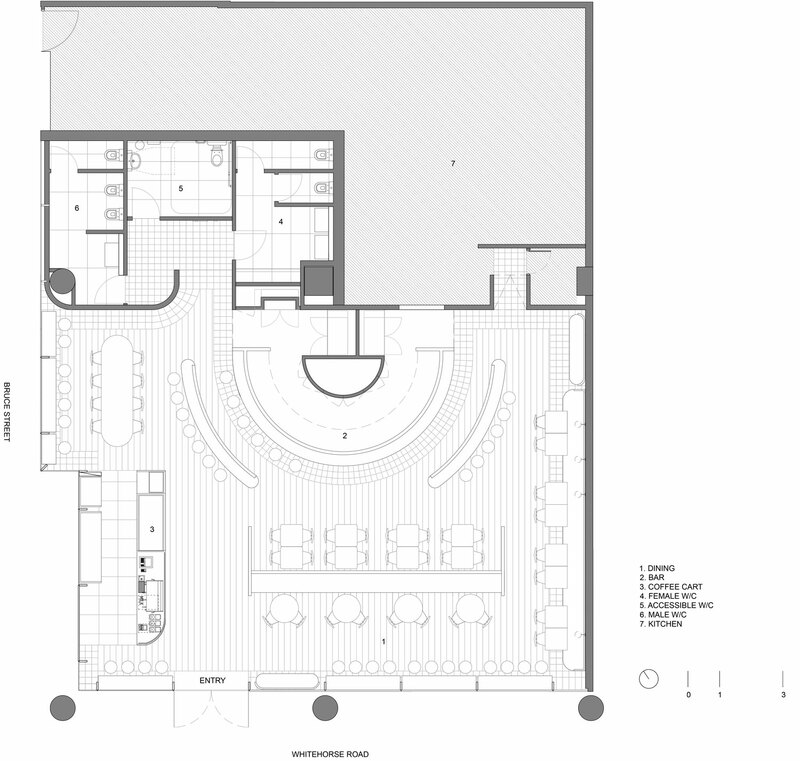 This cemented for us that working collaboratively makes for a well thought through project with a great end result. There are always small things you would tweak however nothing of significance. We had the opportunity to be involved in every aspect from day dot, this allowed us to capture everything along the way. 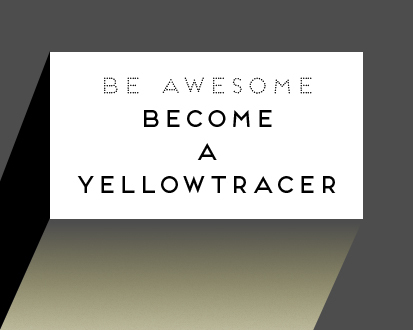 + Any interesting/ funny/ quirky facts you could share with us? 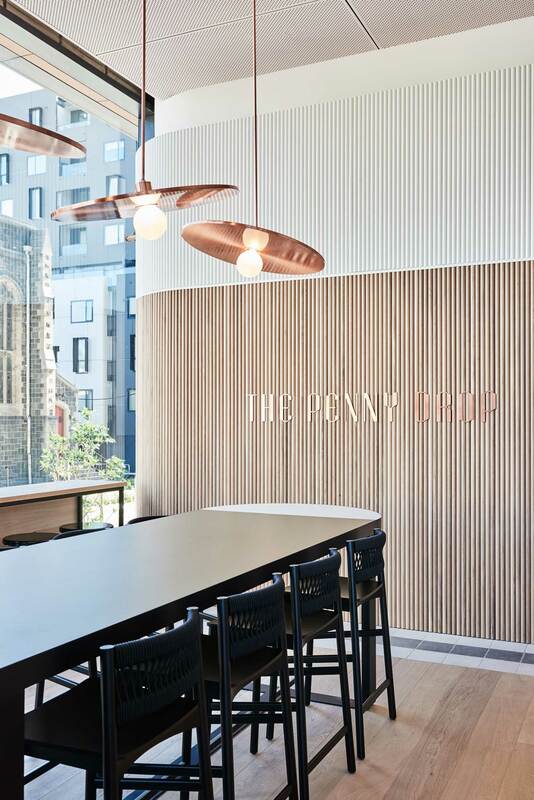 The Penny Drop Café plays on the concept of the ‘penny dropping’ from the pockets of the ATO office above. 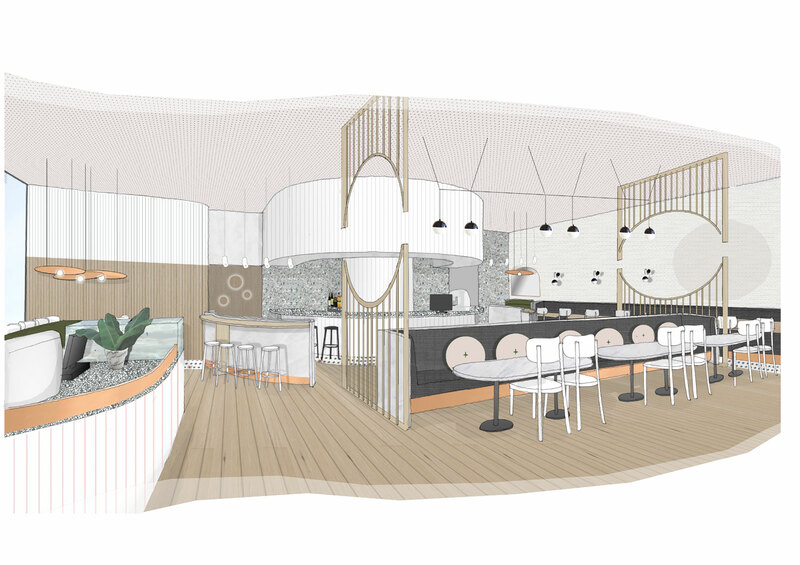 Our client identified a gap in the market for a vibrant all-day eatery in Box Hill, in realisation of this the penny metaphorically dropped. 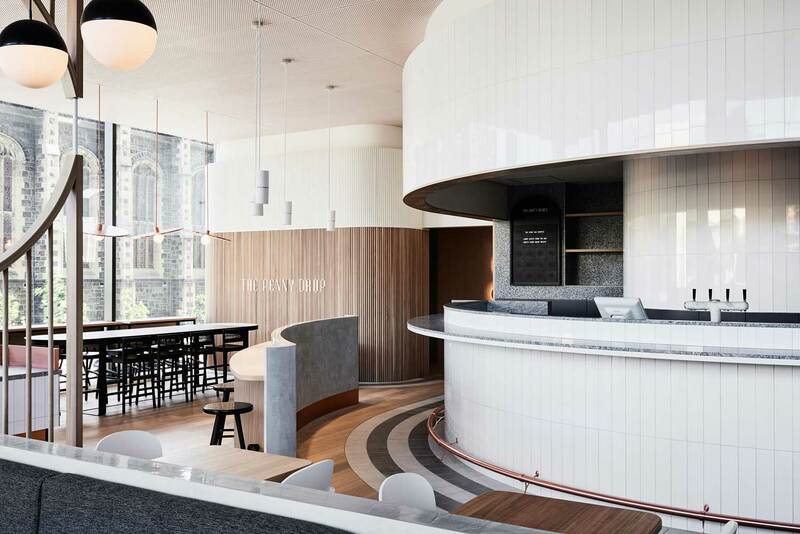 The space planning was a direct response to the concept of the ‘penny dropping’ The curved form of the bar and seating layout that surrounds it echoes the ‘ripple effect’ the same effect the owners hoped The Penny Drop would have on Box Hill and its residents. Antidote, A Colour Cure: 2017 Dulux Colour Forecast. 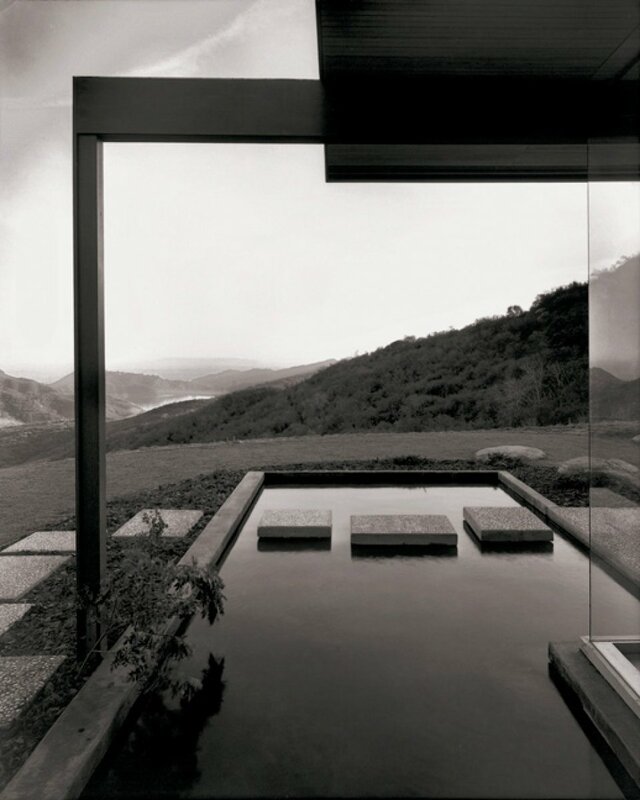 It would be so nice to see an environment with a softer acoustic. 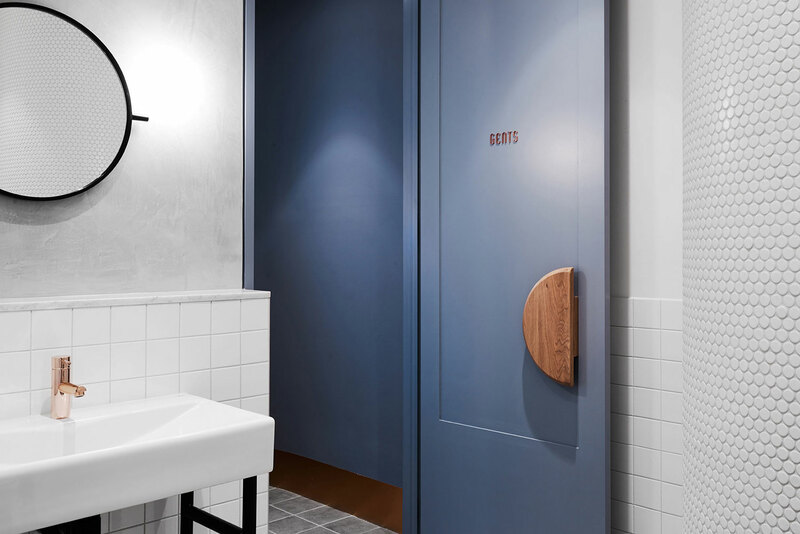 Some rugs or wall hangings of cloth and cushions would lessen the very loud noises that naturally go with these hard surfaces plus plates and cutlery and lots of people talking. It seems that all the new environments want to be modern and they are all ending up the same in this regard: too damn noisy! I’d like one that gave my ears a break!